We are very proud that this can opener is made entirely in the USA. Our Steuby manufactured Ez-Duz-It can opener is famous for its smooth, easy gear driven operation. It is made right here in Hazelwood, Missouri in our 144,000 facility. 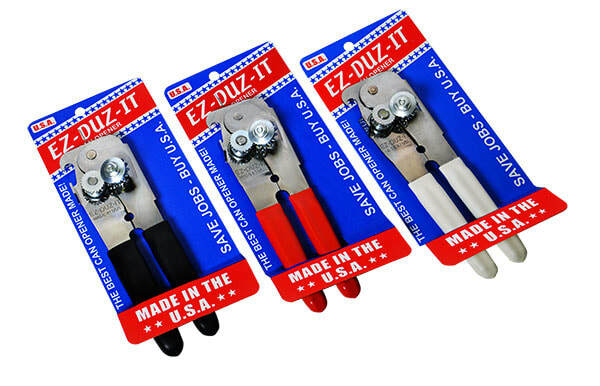 It can be found, for retail purchase, at both large and small brick & mortar stores and on the large, trusted website stores.The Ez-Duz-It can opener comes in black but is also available in red, white and blue. It is USA made and we are damn proud of it.